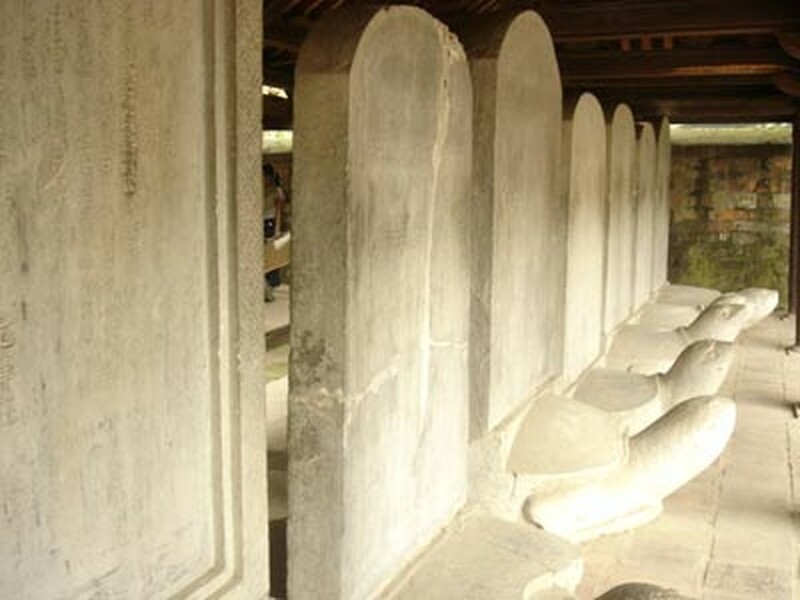 It is believed that touching the heads of stone turtles of Hanoi’s Van Mieu (Temple of Literature), the first Vietnamese university, will bring students good luck. Therefore, the management board of Van Mieu has mobilized all staff and youth volunteers to “protect” stone turtles from being touched by students as the date of the university entrance exam fast approaches. The 82 stone stelae, honored as part of UNESCO's Memory of the World Program on March 9, 2010, contains the inscribed names of doctoral laureates who passed imperial examinations during the era of the Le and Mac dynasties, which reigned from 1442 to 1779. According to legend, students will enjoy good luck if they touch the turtlehead before taking tests. 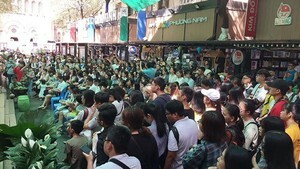 In the days leading up to the entrance university examination, scorching hot weather in Hanoi did not hinder examinees and their relatives from waiting in a long queues, as they waited to enter the Temple of Literature to perform this rite of luck before the upcoming, all-important examination. Dr. Dang Kim Ngoc, director of the center of scientific and cultural activities of the Temple of Literature, said it is a mere fabrication that touching turtleheads brings good luck; however, many high school graduates due to take entrance examinations believe in the superstition nonetheless. All staff and local youth volunteers have been called in to help prevent visitors from touching the turtleheads; however, their efforts have been unsuccessful, as superstitious people have persisted in their quest to touch the historic turtles, said Dr. Ngoc. To protect the 82 stone stelae, the center constructed a stainless steel barrier around the stelae but people lacking respect destroyed it, Dr. Ngoc complained. Dr. Ngoc said the center has planned two additional protection schemes. The first is to use a strong transparent glass barrier (above the turtlehead) surrounding the stelae, while ensuring ventilation inside and outside. The second proposal is to use a wood column fence decorated with the colors and patterns used in ancient times, to separate visitors from the turtles. The designs of these fences match the roof and interior of the temple. However, no final decision has been made. The Temple has been selected frequently, to host special events because it is a historically significant place, leading to constant touching of the stelae, which contains important documentation for studies related to the history of Vietnamese fine art and sculpture from the 15th to 18th centuries. The government should raise public awareness through media and education and should quickly adopt a measure to protect the precious stelae from destruction.